Josh Norris will be expected to be a leader off the ice for Team USA at the upcoming World Junior Championship. Today, he did some leading on it. The Oxford native – one of the players returning from last year’s U.S. WJC squad – scored the game-tying goal halfway through the third period of today’s game against Sweden at the World Junior Summer Showcase. 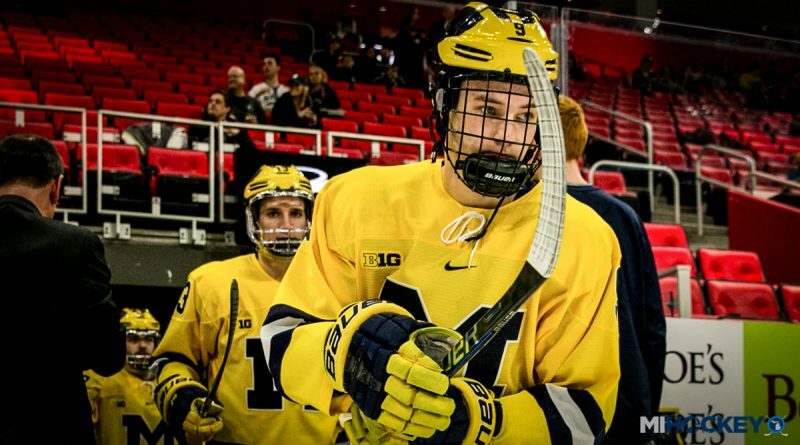 Then, the USA Hockey’s National Team Development Program alum and University of Michigan sophomore-to-be scored again…in the final seconds of overtime. Hughes dances and dishes to Norris to win it in OT with 2.5 seconds left. MiHockey will share the video highlights when they are available. Norris wasn’t the only Michigan name to thrive in the first game since Team USA merged their split-squad rosters. NTDP forward Jack Hughes scored Team USA’s first goal, set up by brother Quinn (another NTDP alum and Wolverines sophomore-to-be). Northville native Jason Robertson scored Team USA’s second goal (set up by Quinn Hughes), and Canton native Paul Cotter (a Western Michigan freshman-to-be) scored the team’s third goal – one that brought the score even at 3-3. Mattias Samuelsson, a NTDP product and fellow future Bronco, set up that goal.